IRt/c infrared thermocouples are designed to be used with all thermocouple readout devices and controllers, but due to the higher impedance levels of the IRt/c compared to standard t/c’s, some controllers are better suited than others. Leakage current generated by the controller (see Tech Note #16) creates an offset in reading which should be adjusted out for accurate temperatures. If the offset produced by the leakage current is larger than the available offset adjustment of the controller, the IRt/c will still produce repeatable readings and control accurately, but the temperature indication will be incorrect. 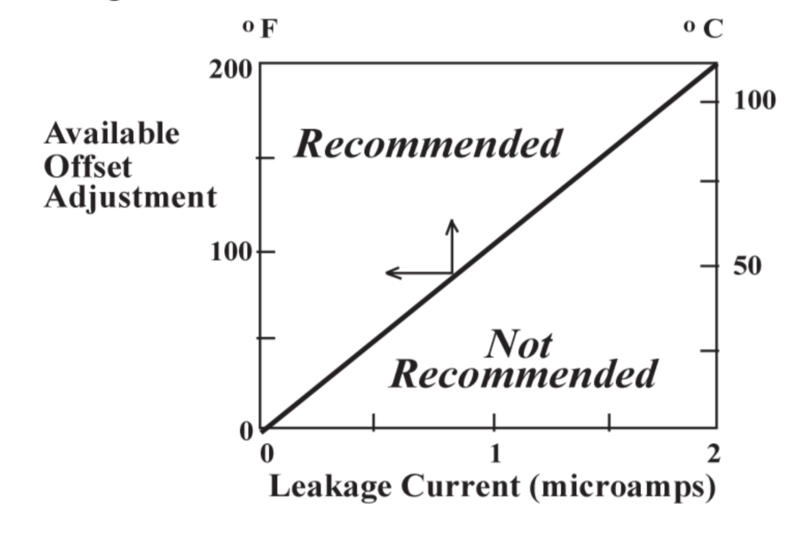 Accordingly, recommended controllers are those which have low leakage currents and/or sufficient offset adjustment to produce an accurate IRt/c reading (see chart for relationship between leakage current and offset). This list is not a comprehensive one - manufacturers are constantly improving their models. Contact your local Authorized IRt/c Distributor for specific models, or the controller manufacturer to inquire as to suitability of specific models for service with an IRt/c (sensor impedance of ~5 Kohms).